When science engagement programs align with another organisation’s values and strategy, exciting opportunities for partnerships arise. But before making an approach to anyone to invite their participation in a project, it pays to know who they are, what they stand for and how your value proposition will be of benefit to them. Sarah Pring and Angela Ryan are both from PwC, one of Australia’s largest consulting firms. Their joint presentation to the 2014 Regional Science Hub Leadership Forum provided all kinds of useful information about developing partnership proposals. As a Corporate Responsibility Manager, Sarah shared insights into why and how PwC partners with community projects. Invariably, the company is looking to support projects that will deliver on the company’s priority areas for societal impact. Among community projects PwC supports are social innovation and educational initiatives, with an emerging focus on science, technology, engineering and maths. In terms of why some approaches are more successful than others, Sarah explained that of critical importance in deciding whether to partner with a community initiative is the opportunity for PwC staff to get involved. “Another criteria that boosts chances of success is when the aspirations of the community partner mirrors our priorities, and we can see that they really are adding value to what we are seeking to achieve as a company,” she added. Sarah recommends that people seeking corporate partnerships conduct thorough research in order to understand what a company’s values are and what level of community involvement it engages in. All of this information is readily available online in annual reports and other corporate documents so it is worth doing as much as you can to demonstrate your awareness. “Before asking for support, show that you understand a company inside out and that what you are offering can help them achieve their goals,” she said. Sarah also emphasised the importance of tailoring any partnership approach to a company so that it reflects the target’s stated missions and values. Sarah suggests that community groups should think creatively about the type of support requested. “Partnerships can represent all kinds of support, from financial contributions to in-kind professional services and staff volunteers,” she added. Angela then talked about how to create a value proposition that will resonate with potential partners. As the Leader of Pursuit Coaching and Bid Management, Angela works with PwC’s bid teams to create value propositions that are client centric. Angela warned that a partnership proposal will not succeed unless it can clearly identify a benefit and positive impact to the client as a result of the suggested collaboration. She then shared some practical information about how her team works with colleagues to develop a pitch. Again, Angela recommends jumping on LinkedIn to identify what are the relevant issues for the company you are targeting. Identify stakeholder business problem: is your background research on the company completed? And have you also listened to and learned from the client to fully understand their business issues. Identify and customise solution or service: provide a clear rationale of how we help the organisation improve and/or identify something the client can do or understand differently. 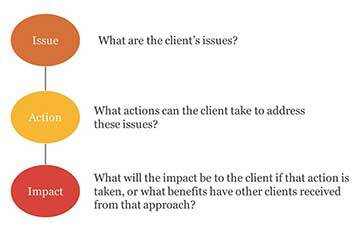 Define the benefits: what are the benefits of the proposed solution to the client (and only the client)? If you’re happy with your value proposition, it’s time to begin testing it. Angela Ryan is PwC’s Leader Pursuit Coaching and Bid Management and Sarah Pring is Manager Corporate Responsibility at PwC. From 2015 PwC will be focusing its corporate responsibility efforts on advancing Australia’s future capability in science, technology, engineering and mathematics (STEM). CEO Luke Sayers says that the company’s vision is to help Australia become a global leader in problem solving and innovation underpinned by excellence in STEM capabilities.